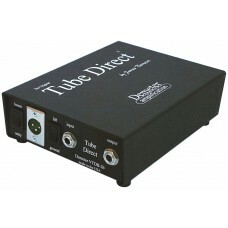 The Demeter Tube Direct Box is the DI of choice for hundreds of studios, engineers, producers and artists the world over. The clear, warm quality of the Tube Direct enables it to maximize the sound of all types of musical instruments. Whether your application is an acoustic guitar pickup into a porta-studio or thousands of dollars of synths and samplers recorded direct-to-disk, the Demeter Tube Direct Box provides the highest fidelity available. The original single-channel Tube Direct Box (VTDB-2B) is our most popular tube direct box. Used in the studio and on the road over twenty years, this is the choice for flexibility, portability and economy. It has the extremely high input impedance and tremendous headroom necessary to prevent loading and to preserve the wide dynamic range of the instrument. Acoustic guitar: the extremely high impedance (over 20 M) of the Tube Direct insures a perfect match with every pickup to provide a warmer, more natural sound-both live and in the studio. Electric guitar (clean DI sound): the Tube Direct provides a clear, warm sound that retains all of the guitar's natural brilliance and harmonics for creating a viable (many feel the only) direct electric guitar sound with or without additional signal processing. Electric guitar (amplified): the buffered 1/4" output jack can be used to drive an amplifier through up to 50 feet of guitar cable. It also prevents cable loading to produce a fuller sound from both single coil and humbucking pickups. Pedalboards and effects devices: the buffered 1/4" output jack is ideal for running through all types of pedals and effects with virtually no signal loss. Synthesizers, drum machines and samplers: the Tube Direct warms up the sound of the synthesizer and provides an ideal interface for the variety of synthesizer output levels and impedances. Digital and hard disk recording: the clarity and sheen of digital and hard disk recording can sometimes seem a little harsh or more brittle than desired. Judicious use of the Tube Direct can often mitigate this problem at several points in the recording chain, including mixdown.